Compared to the established Bayer process for alumina production, the ENSUREAL process will increase alumina production yield by 15 percentile points and reduce energy consumption by 5.4 GJ/t of alumina associated with the heat demand in the Bayer circle (53% of the total energy demand in the AoG Alumina refinery plant). Assess, as only an extra the improvement potential of the smelting process by addition of red mud and low quality bauxite. Assess, test and control the novel fluidized bed calcination process. Processes will initially be validated in laboratory scale, and then it will be demonstrated in industrial setting at AoG and OT. Production of at least 50 kg of unhydrated alumina is expected. The whole process stability will be evaluated through chosen KPI and a LCA, to confirm the improvement of the yield. Iron testing: At least 200 kg pig-iron will be produced. Quality will be checked to further application in the European foundry industry at the Odlewnie foundry. Grey mud testing: The grey mud is a non-toxic CaCO3 rich product that can be utilized as raw material in cement production, in agriculture or as filler material in advanced materials. The goal is to confirm the suitability for these applications and show that this grey mud is not an environmental problem like the red mud that is produced from the Bayer process. The European bauxite ores are relatively rich in REE and Sc, which until this day accumulate in the respective Bauxite Residues.  In ENSUREAL, REE/Sc ions are leached from the calcium aluminate slag with conventional and innovative reagents to form dilute pregnant liquid solution (PLS) with 100-300 mg/L REE. The pregnant solution after leaching (dependent on the amount and the type of metal impurities) will initially be purified through differential precipitation and then the REEs as well as Sc will be precipitated as hydroxides or carbonates which in a subsequent calcination stage will be transformed to oxides that constitutes the final mixed REEs & Sc concentrate. The main goal of this process is the final production of a mixed REEs & Sc concentrate (>20%w/w) that can be sold to a refiner for production of pure REEs and Sc. Social Acceptance through appropriate communication activities. The identified bottlenecks and knowledge gap in the supply chain will be found and highlighted through this process evaluation. Disseminate and communicate with current and past H2020 initiatives and consortiums. Essentially, within the SC5-15, 16 and 17 global clustering initiatives of 2016 and 2017; If suitable, integrate results of launched H2020 projects.